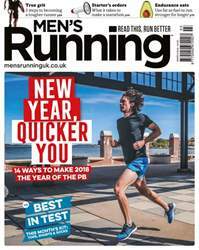 The March issue of Men’s Running was designed with New Year motivation in mind. Whether you’re a persistent pavement pounder, or are completely new to running altogether, this issue is packed with expert advice on becoming a tougher, stronger, quicker and happier runner - from 14 easy-to-adopt ways to boost performance, to a three-page spread on learning to grit your teeth, push your limits and realise your true potential. We’ve also got exclusive reviews of the latest short-sleeved tops, shorts and running socks - with the best product in each category receiving the MR ‘Best in Test’ seal of approval. For a rarely covered behind-the-scenes look at what it takes to organise a large-scale race, head to our ‘Making a Marathon’ feature, and of course we’ve also got the usual training advice, race reports and nutrition know-how to help you hit the ground running in 2018.